$949$9 and 49 cents$0.47 / oz. 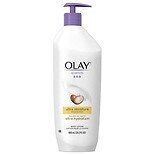 Shop Olay Quench Body Lotion Shimmer with Pump (20.2 oz. )20.2 oz.